The main character tells the story of his first day of kindergarten. It’s a strange and unusual place. He is prepared with his medical check-up and supplies. Then the day arrives, his father takes him in his rocket booster. The boy is afraid they might crash into a comet or get sucked into a black hole. When he arrives, he is assigned to his commander, capsule, and crew mates. There are many aliens from many different galaxies on Planet Kindergarten. Mission Control calls on the intercom welcoming them all on their journey. The boy notices that everyone has to get used to the new atmosphere where gravity works differently. At recess, he leaves the capsule with his crew mates to explore and test the situation. After a disagreement over the equipment he and another crew mate have to sit in isolation. Back in the capsule, they run experiments and write in their logs. At lunchtime, he learns that he loves space food! Afterwards, he has trouble with rest time and worries that he’s running out of oxygen. Then he remembers the NASA motto: Failure is not an option. He takes a deep breath and gets back to work. Before he knows it, his mission is complete and his parents rush to greet him. Back home on his own planet, it’s splashdown then time for bed. This time he’s ready and thinking about returning the next day. 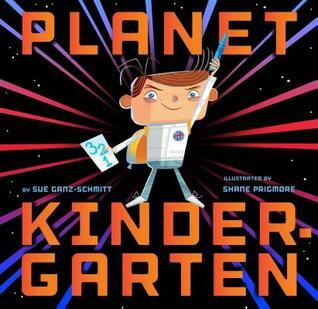 Sue Ganz-Schmitt writes this story with imagination and just enough space jargon to keep little explorers involved and interested in the boy’s adventure in kindergarten. Shane Prigmore’s illustrations are quirky and action packed. Readers will enjoy exploring each page for unusual details. I think this book will be a great help in preparing little ones for kindergarten. Knowing ahead of time that the rules of gravity involve sitting in your seat and raising your hand or that time-out may be employed for misconduct on the playground, help astronauts-in-training understand what to expect in school. In a place where everything is new, readers will enjoy exploring each page. ← I Am Cow, Hear Me Moo! What a clever book idea. Sounds very entertaining. Great way to get kids to want to go to school. Yes, very clever. It was a little on the busy side, but I think kids will love it!